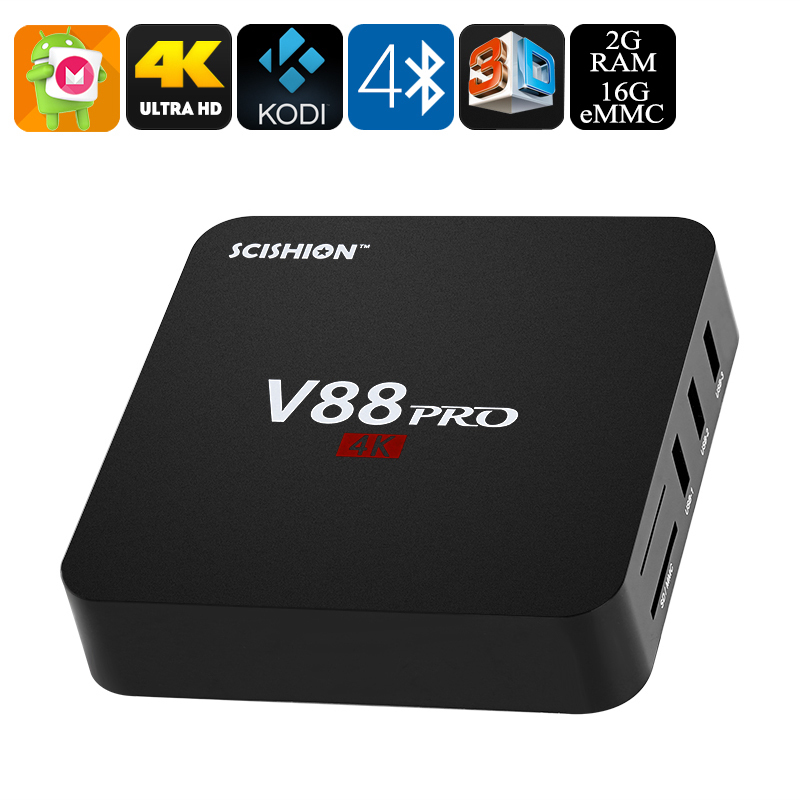 Successfully Added SCISHION V88 Pro+ TV Box - S905X CPU, 2GB RAM, 4Kx2K, Android 6.0, 3D Movie, 4xUSB, 16GB Memory to your Shopping Cart. 4K resolutions and Android 6.0 make sure this TV box is fully future proof. The best of both worlds the SCISHION V88 Pro+ is a media player and minicomputer rolled into one. powered by an Amlogic S905X quad-core 2GHz processor and 2 GB of RAM you're ensured a smooth performance. the 16GB of storage should be sufficient for most but with a micro SD card you can double this to 32GB and the 4 USB ports offer plenty of other storage options. Android 6.0 can be fully customized to suit your needs and brings plenty of updates for an intuitive user experience. With access to the Google Play Store, there is a bountiful wealth of apps and games so surfing the web, streaming movies or chatting with friends and relative from the comfort of your living room couldn't be easier. Using HDMI 2.0 means this TV box has support for 4K outputs so you can take advantage of a 4K TVs full resolutions or be set for the future when UHD screens become more affordable. with its 3D movie support as well as H.264 and H.265 media formats this TV box is able to support the latest and best media formats. Great connectivity for speakers (SPDIF), game controllers (Bluetooth 4.0) and other peripherals (4x USB) lets you integrate this TV box into your home media and entertainment setup so all that is required if for you to sit back and enjoy the fun. This the SCISHION V88 Pro+ TV box comes with a 12 months warranty, brought to you by the leader in electronic devices as well as wholesale Android TV Boxes.. This company is awesome. Four day shipping to US. Getting to place 2nd order.